Since 1992, Eagle Plains Resources (EPL:TSX-V) has been acquiring and developing early stage mineral exploration projects in Western Canada. To develop these projects, we have assembled an expert in-house technical team of geologists, technicians and geographic information system specialists. Seasonally we also contract geologists specializing in specific types of mineralization to assist with our field programs. The company currently controls over 35 gold, silver, uranium and base-metal and rare earth mineral projects. With over 35 projects, EPL is considered a project generator and invites joint venture participation to expedite project development. The joint venture model reduces shareholder exposure to the risk of exploration while enhancing exposure to a discovery directly on Eagle Plains projects and indirectly through it's portfolio of shares of other companies. With our in-house staff we are able to technically assist our joint venture partners. Below is a chart depicting annual exploration expenditures on Eagle Plains projects by Eagle Plains, it's Option Partners and Teck during the Strategic Alliance. Finally, the 3rd party operations amount is the value of work that our subsidiary company that employs our technical team, Terralogic Exploration Inc., has conducted for third parties, this creates revenue for Eagle Plains. To create shareholder value when a discovery is made or a project is developed beyond the grass roots level, EPL may elect to spin-off the project into a new corporate entity. This spotlights the value of the more advanced project, creates value with new shares to the shareholder and makes it available for acquisition by a producing company. 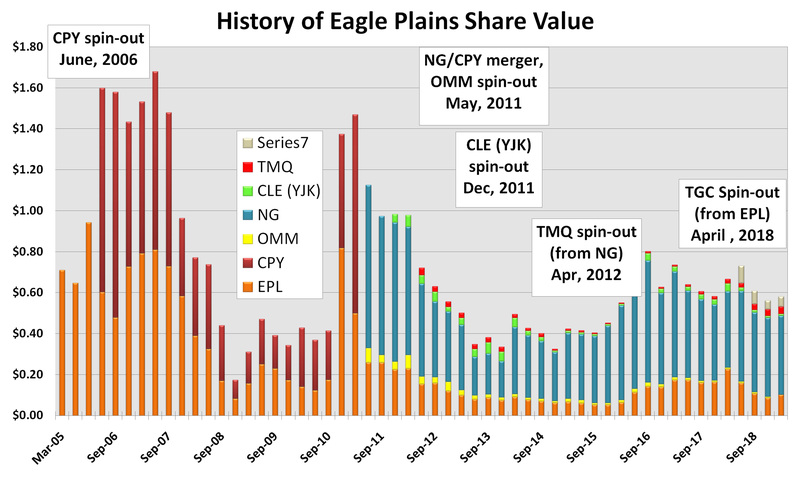 Eagle Plains first spin-off was Copper Canyon Resources in June 2006 on a one-for-one share basis. Copper Canyon Resources was in turn purchased by NovaGold Resources in early 2011 on a 13.5 CPY for 1 NG share basis, As a result of the purchase, several exploration projects were again spun-off from Copper Canyon Resources into a new corporation called Omineca Mining and Metals. This spin-off resulted in a 1 OMM for 4 CPY share basis.distribution. The most recent Eagle Plains spin-off is Yellowjacket Resources, now Clean Commodities Corporation, which resultied in a one-for-three share distribution to Eagle Plains Shareholders. Acquisition of highly prospective grass roots and semi-developed mineral exploration projects. Spin-off developed projects to create value for shareholders which also simplifies the project for the market place and makes it accessible to producing companies. Below is a graphic example of the value that Eagle Plains Resources has created since 2005 including the spin-off of Copper Canyon Resources, Omineca Mining & Metals and Yellowjacket Resources (now Clean Commodities Corp).